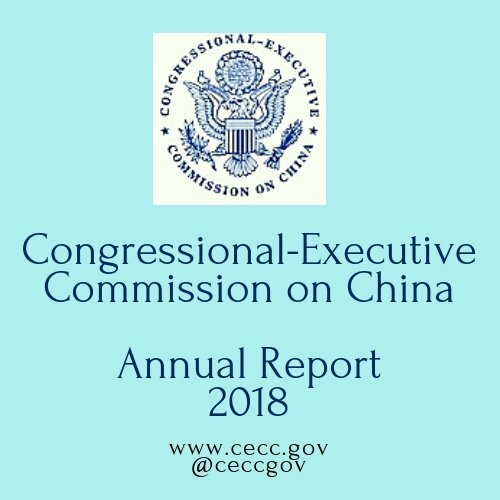 The Congressional-Executive Commission on China’s (“CECC”) 2018 Annual Report (“the Report”), released on October 10, 2018, comes at a crucial point in world affairs. The United States is on the retreat from the global stage, withdrawing from key international agreements and organizations, and China appears intent to replace it. But as the CECC’s 2018 Annual Report makes clear, with President Xi Jinping’s complete consolidation of power this year and the re-entrenchment of the Chinese Communist Party (“CCP” or “the Party”) within the state, China’s rise will likely alter the current world order and challenge U.S. values and interests. 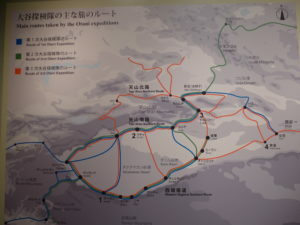 If anything, China’s recent behavior – the public disappearance of Meng Hongwei, the former Interpol chief and the issuance of more discriminatory regulations directed at Uighurs – only substantiates CECC’s predictions that China’s rise will not be inline with the values that have dominated the world order since the end of World War II. 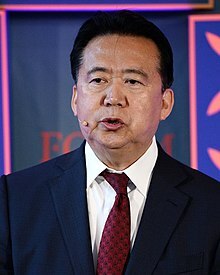 Former Interpol Chief, Meng Hongwei, now in NSC confinement. 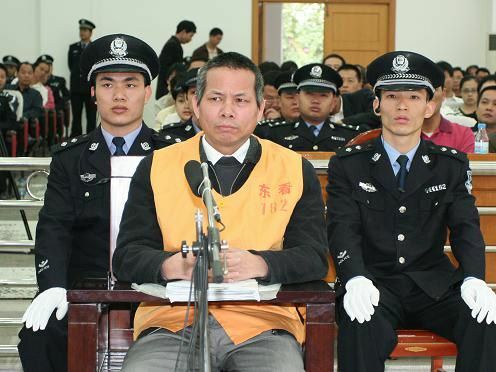 The CECC was created in 2000 to monitor China’s human rights commitments, review its progress in developing a rule of law, and maintain a database of Chinese political prisoners. With a staff of China experts, the CECC has become a leading voice on China’s progress in regards to international human rights standards and the development of rule of law in more sensitive areas such as freedom of expression, criminal justice and access to justice. As with its previous reports, the 2018 Annual Report is extremely well researched and extensively documented, providing an important snapshot to what is really happening in China, making it an essential read. While prior annual reports highlighted China’s progress in trying to meet international human rights standards or deepen its commitment to rule of law, the 2018 Annual Report is devoid of any positive developments. And rightfully so. As the Report makes clear, three alarming developments in the past year reflect a country intent on disregarding international human rights norms and turning its back to a rule of law. 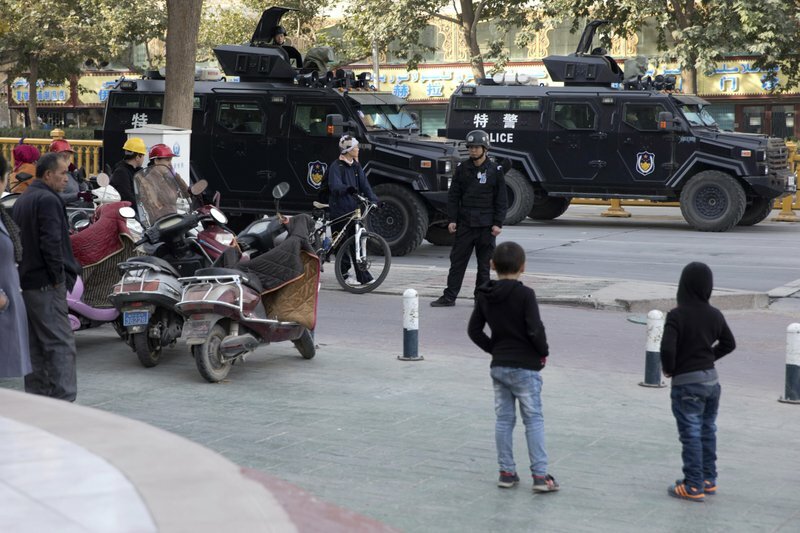 A police state in the Uighur province of Xinjiang in China’s far West. (Photo courtesy of The Week (UK)). Perhaps the Report’s most urgent issue is the Chinese government’s mass detention of what is estimated to be 1 million Uighurs in internment camps. Without any trial or criminal charges, these internment camps reflect the Chinese government’s stated goal to “sinicize” religion, including that of the Uighurs, a Muslim minority population in Xinjiang province. And the mass detentions show no signs of stopping. As the CECC documents, the Chinese government’s own procurement data shows its plan to build more camps. A second worrying development is the re-entrenchment of the Party within the State. 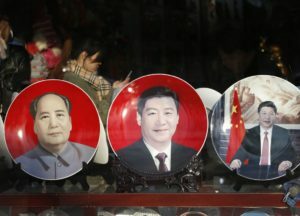 During much of Chairman Mao’s time, the Party and the State were essentially one, but since then, the Chinese government has sought to separate the Party from the government bureaucracy. Until now. In March 2018, the Party Central Committee issued a restructuring plan to again embed the Party in government work, with the Party taking a leadership role. Perhaps the most notable example of the infiltration of the Party into everyday life is the creation of the National Supervisory Commission (“NSC”), an anti-corruption commission that has the power to “confine” – in other words, extra-judicially detain – any Party member or state employee suspected of corruption for three months without access to an attorney. Employees of state-owned enterprises, staff of public hospitals and public educators all fall under the NSC’s purview. Even non-Party members and non-state employees could be subject to “confinement” by the NSC if they too are suspected of involvement in official misconduct. Outside of the judiciary, the NSC is anything but due process. China’s ubiquitous security cameras. (Photo Courtesy of the Huffington Post). Finally, the 2018 Annual Report highlights the Chinese government’s continued use of technology as a tool of repression. 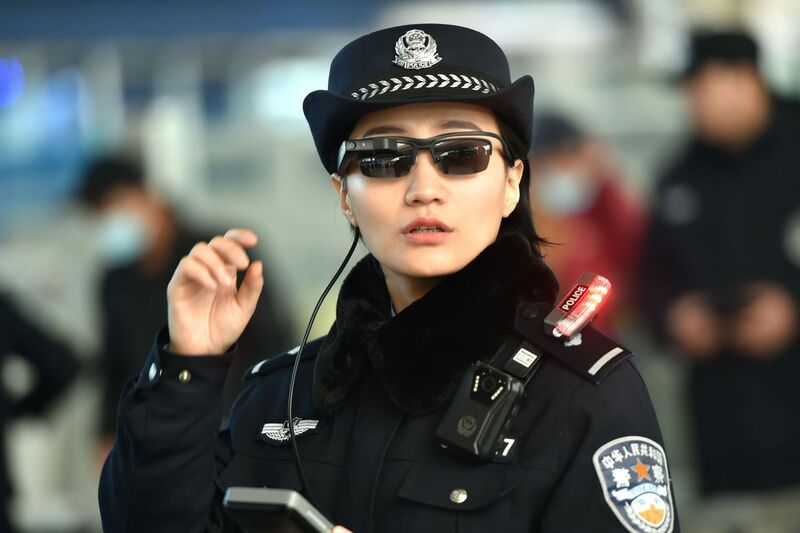 The Chinese government is seeking to create a biometric database as well as a “social credit system” which, if realized, could have lasting effects on certain individuals. 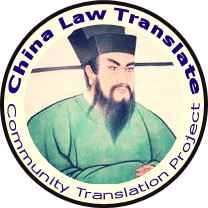 The 2018 Annual Report concludes by offering some key recommendations, notably addressing abuses in Xinjiang publicly – and with key allies – before the United Nations, raising the issue of human rights in all bilateral relations, not just during the Department of State’s human rights dialogues with China, and condition law enforcement cooperation, such as cooperation on extradition, on a signed agreement from the Chinese government that it will respect due process in all situations. But one wonders if these recommendations fall on deaf ears. The CECC is supposed to be a joint commission between Congress and the Executive. But as reflected in the masthead for this year’s Report, the Executive positions on the CECC remain empty. While the Trump Administration is not shy in lambasting China on a variety of issues, and in early September word was leaked that it was considering economic sanctions against China for its internment of Uighurs, the fact that key Executive positions on the CECC remain empty over a year and a half into the Trump Administration, belies any meaningful commitment by the Administration to human rights and rule of law in China. An unfortunate development given the severe situation documented in the CECC’s 2018 Annual Report and the danger it poses to the United States and the post-World War II world order. 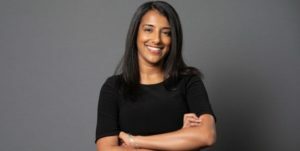 Forced Departure of American Journalist Megha Rajagopalan – Is it Really Not About Xinjiang? Every three years, the Chinese government has effectively expelled a foreign journalist from China. It started with Melissa Chan, an American journalist working for Al Jazeera, in 2012. In 2015, it was Ursula Gauthier, a French journalist for L’Obs. And last month it was Megha Rajagopalan, the Beijing Bureau chief of the online news magazine Buzzfeed. With each expulsion of a foreign journalist comes speculation as to why. Why did the Chinese authorities fail to renew a visa or cancel a press card. The Chinese government hardly ever explains its reasons, citing that such failure to renew a visa was “in accordance with law.” But no law or regulation is ever cited, let alone a specific provision. As a result, most outside of China view the Chinese government’s decision having more to do with the reporter’s coverage of China than with any violated regulation. With Gauthier, the Chinese government was more explicit about its decision to cancel her press card, with the Ministry of Foreign Affairs (MOFA) criticizing Gauthier by name because of her scathing editorial on the Chinese government’s treatment of the Uighurs, a Muslim ethnic minority, in the Xinjiang Uighur Autonomous Region of China. 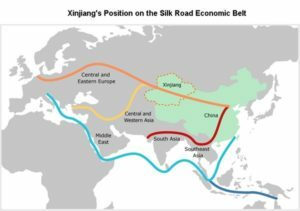 Rajagopalan’s Reporting on Xinjiang – Why Is the Chinese Government So Sensitive About This? Like Gauthier, Rajagopalan had done some hard-hitting reporting on the Uighers in Xinjiang, with an October 2017 article exposing the Chinese government’s increased surveillance and its mass detention of Uighurs for no other reason than being Uighur. Reporting from Xinjiang, Rajagopalan’s article was one of the first to uncover the Chinese government’s frightening oppression of Uighurs. It also won her the Human Rights Press Awards’ Best Features Article (English) for that year. In July 2018, Rajagopalan followed up her ground-breaking piece with another explosive article that brought to light the Chinese government’s pressure tactics on Uighurs abroad, including threats to send their Xinjiang-based family to internment camps if they do not spy on other Uighurs. Xinjiang has long been a sensitive area for the Chinese government, fearing that the Muslim Uighurs could launch a successful separatist movement. As a result, for over a decade, the Chinese government has instituted a national policy to “Go West,” encouraging ethnically Han Chinese to move to Xinjiang to develop this resource-rich area. With the Go West policy, Xinjiang’s population has changed dramatically, with a current Han population of 40%, compared to 6% in 1949. 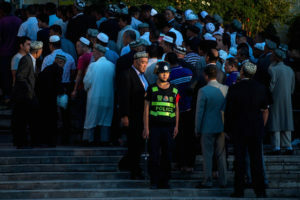 And with the increase in the Han population has come a decrease in the Uighur’s political clout and self-governance since Chinese Communist Party membership usually means giving up religion. Few of the ethnically Muslim Uighurs are atheists and hence, unable to join the Party, and thus unable to effect change in their own region. 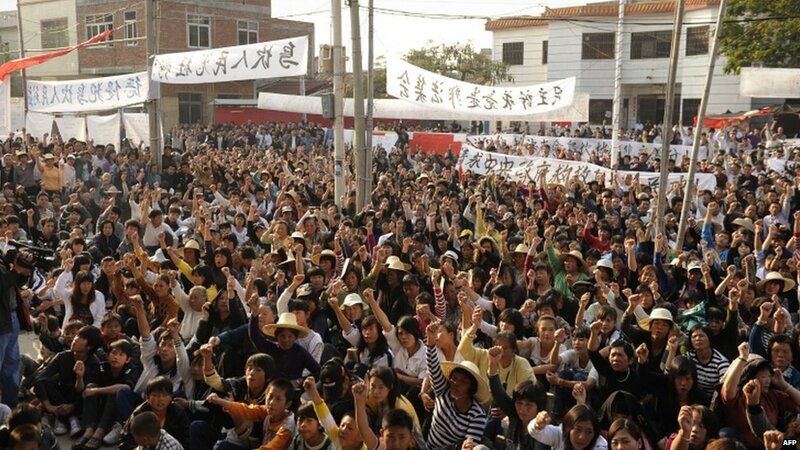 For example, when, in 2009, the Chinese government decided to destroy much of the the old city of Kashgar, a city that stood for centuries and was perhaps the most Uighur area of all of Xinjiang, the Uighurs were unable to stop it. Needless to say, such loss of power over their own destinies and the attempted destruction of their own cultural identity has not produced a population satisfied with Chinese rule. Since Rajagopalan’s October 2017 article, both by the United States Department of State and the United Nations estimate that close to a million Uighurs have been sent to these internment camps without any trial, all for the purpose of stamping out the Uighur identity. And there appears to be no end in sight with satellite images showing the rapid building of what looks like even more internment camps. Chinese police officer stands guard outside a mosque in Xinjiang. As more and more information began to emerge in the international media about the depth of the Chinese government’s whole-scale human rights violations against Uighurs, and as foreign governments and international bodies began to take notice and advocate sanctions against China, Rajagopalan’s visa was almost up and the Chinese government was in the midst of determining whether to renew it. In May 2018, MOFA, the oversight agency of foreign journalists, informed Buzzfeed Rajagopalan’s journalist visa would not be renewed, forcing Rajagopalan to leave China as soon as it expired. 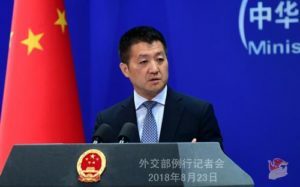 When questioned at an August 23, 2018 press conference, MOFA spokesperson Lu Wei stated that Rajagopalan’s visa issue was handled “in accordance with law and regulation” and, in his remarks, made a distinction, without explaining the significance, between Rajagopalan’s visa – a short-term journalist visa, known as a J-2 visa – and a resident foreign reporter’s visa, known as a J-1 visa. Are J-2 Visa’s Non-Renewable Under Chinese Law? Unlike the United States, where there is only one type of journalist visa, Chinese law distinguishes between two types of journalist visas, the J-1 and the J-2. The J-1 visa can only be issued to journalists whose news agency has a permanent office in China (See Regulations on the Exit-Entry of Foreign Administration of Foreign Nationals (“Exit-Entry Regulations”), Article 6(5)). Because of the “permanent office” requirement, J-1 visas are increasingly issued to only more traditional outlets; think the New York Times, the Washington Post, the Guardian, etc. J-1 visas also confers residency status, and J-1 visa holders must also apply for a Press Card from MOFA within 7 business days of their arrival in China. (See Regulations of the People’s Republic of China on News Coverage by Permanent Offices of Foreign Media Organizations and Foreign Journalists (“Foreign Media Regulations”), Article 10). J-2 visas are issued to journalists who come to China for short-term reporting and there is no permanent office requirement. (Exit-Entry Regulations, Article 6(5).) Traditionally, those are journalists coming to do a one-off story; for example, when a New York Newsday reporter travels to cover the U.S. President’s visit to China, or the Des Moines Register sends a reporter to cover the pork market in China. J-2 visas are limited to six months (Foreign Media Regulations, Article 2) and J-2 journalists do not obtain a Press Card. But increasingly, news agencies are seeking to send long-term reporters to China without establishing a permanent office. This is especially true of online outlets like the Huffington Post and Buzzfeed, who, according to a source with knowledge of China’s visa issues, the Chinese government will not permit to set up a permanent offices. or any agency that just doesn’t have the deep pockets of a Wall Street Journal or a New York Times. But because they do not have a permanent office, Thus, their China-based reporters cannot obtain a J-1 visa. 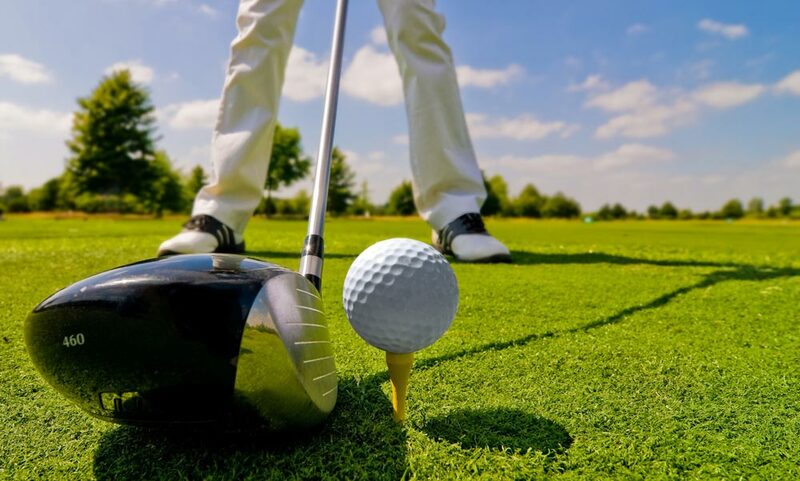 Instead, the Chinese government has been providing these reporters with a J-2 visa with the understanding that the visa will be renewed when the initial term is over. According to the New York Times, this was the deal that Buzzfeed worked out with the Chinese government prior to Rajagopalan’s arrival –a six month J-2 visa renewable upon its expiration. But when Rajagopalan’s six months were up, MOFA failed to renew her J-2 visa. MOFA’s response to the question about the failure to renew Rajagopalan’s visa – that she was not a resident foreign reporter – seems to imply that the law does not permit the renewal of J-2 visas. But this is not true. 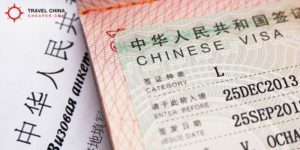 Article 29 of China’s Exit-Entry Administration Law clearly contemplates the renewal of any short-term visa. Article 29 lays out the procedures by which the holder can apply for an extension and the only limitation being that the renewed visa cannot be for a longer length of time than the original visa. In fact, MOFA has renewed J-2 visas in similar situations. For two years, Matt Sheehan was the Huffington Post’s China-based reporter, meaning that his J-2, short-term visa must have been renewed every six months. Similarly, Melissa Chan had three J-2 visas, repeatedly renewed until the Chinese government refused to renew her visa for a fourth time. MOFA had the authority to renew Rajagopalan’s J-2 visa, it just decided not to. And Rajagopalan’s reporting on Xinjiang was the catalyst that has led to the current international attention to Xinjiang, including the United Nations’ Committee on the Elimination of Racial Discrimination’s public rebuke of the Chinese government’s practices in Xinjiang. In July, the Congressional-Executive Commission on China (CECC) held a powerful hearing condemning China’s human rights violations in Xinjiang and calling for the use of the Magnitsky Act against officials involved with Xinjiang. Every day there are more and more articles exposing the internment of millions and the efforts to eliminate the Uighur culture. The international heat is on about the Chinese government’s human rights violations in Xinjiang. And the Chinese government’s failure to renew Rajagopalan’s visa was not just retribution against her. Likely it was intended as a teaching lesson to other journalists – report on this and we might fail to renew your visa too. Fortunately, no one has taken the cue and powerful reporting continues. What will be the test comes this December, when all resident foreign reporters go through the annual rite of renewing their press cards and J-1 visas. On some level, Rajagopalan, with her short-term J-2 visa, was low-hanging fruit. Will the Chinese government conveniently lose paper work of resident foreign journalists, forcing them to leave the country while they wait for their paperwork to be found? Or will press cards be canceled? 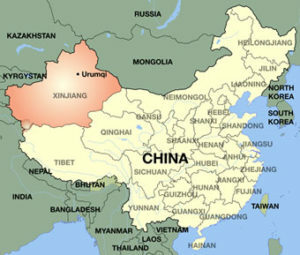 Or even more terrifyingly, will the Chinese government completely close off all access to Xinjiang? Make no mistake, Rajagopalan was only the start. 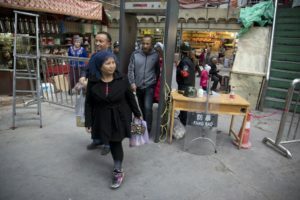 Xinjiang – and the Chinese government’s desire to eradicate a strong Uighur identity – is too important for the Chinese government not to ratchet up its game. President Xi Jinping, trying to be more Mao than Mao? In preparation of the three-day plenum set to start on Monday, the Central Committee of the Chinese Communist Party, the Party’s highest ranking body, announced today that it would propose the elimination of the term limit provision found in the Chinese Constitution. While the proposal still has to be ratified by the National People’s Congress (NPC), which is set to convene on March 5, 2018, the Party-controlled NPC will likely rubberstamp the proposals that emerge from this week’s Party plenum. Added to China’s 1982 Constitution, the term limit provision limits the president and vice-president to two, five-year terms. It was put in place in response to the excesses of the Cultural Revolution and the one-man leadership of Mao Zedong, with its goal to ensure the peaceful transfer of power from one leader to another and eliminate the consolidation of power in one man. But it’s repudiation all but guarantees that current President Xi Jinping will continue on as China’s leader well past 2023, when his second term was to end. It also signifies that, with the rapid purging of rivals through his anti-corruption campaign, all power now resides with Xi. Gone is China’s governing model of a collective Party approach, an approach where Xi would merely be the first among equals, an approach that has ruled China for the last 35 years. The last time a U.S. President met a one-man-rule leader. How will the United States confront this new challenge is anyone’s guess. The United States, only formally recognizing the People’s Republic of China in 1979, has only engaged China with a collective leadership. And as if on cue, last week, the Asia Society’s online magazine, ChinaFile, published a series of conversations from experts about how the U.S. should engage a rising China under Xi Jinping. It’s a very timely piece and well worth the read, with many already acknowledging complete power in Xi. And while Professor Jerome Cohen in his piece rightly points out that Xi will eventually pass from the scene and there will be a reaction to his harsh rule, much like there was when Mao died, expect that point to be much further away now that Xi will likely be able to rule indefinitely. 新年快乐! Welcome Year of The Dog! On Friday, about a quarter of the world’s population will sit down with their families, eat a good meal and celebrate the most festive of holidays in Asia: the Lunar New Year. While most associate the holiday with China, various other countries and cultures also celebrate it – South Korea, North Korea, Vietnam, Taiwan, Hong Kong, the Philippines and Asian communities throughout America. But Friday does not just usher in a new year, it also brings in a new animal in the 12 animal zodiac. And with the new animal, a new year of speculations and predictions. This year is the Earth Dog which, with the earth element, is particularly auspicious since the dog’s internal element is also earth. With earth reinforcing earth, it will reinforce the good. But it will, unfortunately, also reinforce the bad. Thus, it should come as no surprise that the current U.S. president is a dog. And that is the greatest fear for most Chinese feng shui masters for 2018. In general, it is not good luck when the year matches your sign. For dogs, to ward off the bad luck during this dog year, you should look to wear something red for most of the year – a red bracelet, red underwear, red socks – as red is seen to drive away bad luck. But for Donald Trump, that likely will not be enough. That is because Trump is a Fire Dog, and fire and earth clash. According to Feng Shui Master Thierry Chow, “The elements are too much fire [in Trump] and too much earth [in 2018], so that’s going to be causing him imbalance in his fortune.” According to Chow, expect Trump’s fiery rhetoric to bring about “real problems” and tangible consequences. Chow didn’t say if that also includes his tweets. Trump aside, the question still remains – what about your horoscope for the year? That is dependent on how your birth sign deals with the Earth Dog. Check out your personal horoscope here (note you may have to do a Bazi test to determine the strength of your birth year element. You can do that here). But no matter what the future may hold, may you spend Friday ringing in the new year with family, good friends and delicious food! To our Chinese friends who celebrate the new year,新年快乐 (sin knee-an k-why le)! In October, the Guggenheim’s show, Art & China After 1989: Theater of the World, opened to a flurry of criticism, with the museum capitulating to animal rights activists and online protesters by pulling three pieces that involved – and in some cases abused – animals. 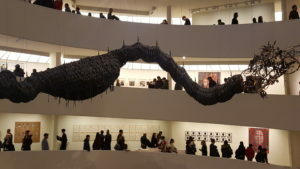 But after seeing the show this past weekend, one has to wonder precisely when the Guggenheim first started on its path of censorship in creating Art & China as self-censorship appears to permeate the first half of the show. Back in Beijing, in the early morning of June 4, soldiers cleared demonstrators from Tiananmen Square, marking the end of a democracy movement to which advanced art had been closely allied. In the months that followed, the publications and institutions that had catalyzed artist discussion throughout the 1980s were reined in or shuttered. . . . 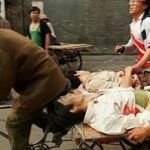 There is no mention of the fact that the Chinese government ordered the massacre of hundreds to possibly thousands of unarmed civilians the night of June 3 into the early morning of June 4, 1989 on the streets surrounding the Square. 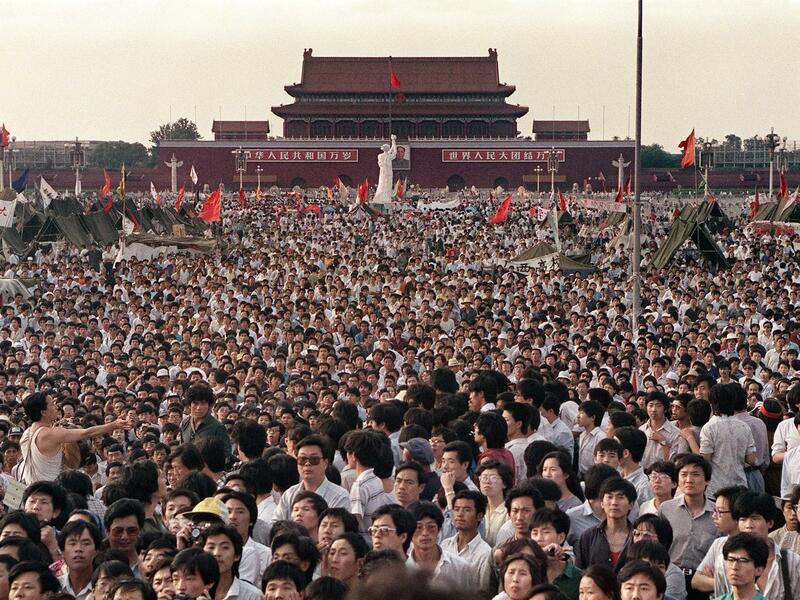 Even the pieces that directly address the Tiananmen massacre, choose not to explain it. Wang Xingwei’s painting of a cyclist ferrying two bleeding penguins does not mention that the painting is a reference to a tragic photo from that night where the penguins were dying people. It does not even show the original photo. 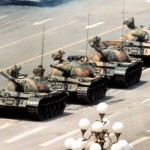 Similarly, Zheng Guogo’s sculpture of a line of deep fried toy tanks makes no mention of the iconic photo of Tank Man – a Chinese man stopping a line of tanks after so many civilians were killed by those same tanks only hours earlier. Again, the original photo is absent. 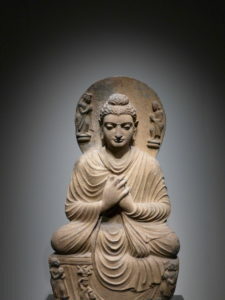 And as Jane Perlez points out in her New York Times piece, even for those artists featured, the Guggenheim chose not to include more powerful and artistic pieces likely because they more honestly and precisely addressed what happened on June 4, 1989 and would arouse the ire of the current Chinese government. There is one piece at the end of the exhibit- Yang Jiechang’s Lifelines I – where the wall plate goes into a little more detail, acknowledging that this piece reflects the zigzag paths that volunteers carried injured protesters to hospitals and to safety. But the Guggenheim should not assume that the people visiting the show will already know the history. This past weekend, much of the crowd appeared to be average tourists, not necessarily people who are China watchers. With many looking like they were below the age of 40 who likely didn’t personally experience the events of 1989. Without putting these early works from 1989 and the early 1990s into the proper historical perspective, these visitors lose the true meaning of not just the works, but what these artists were doing with their movement. 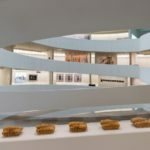 The Guggenheim does a bit of a better job explaining the next major event that impacted these artists – the rapid economic development that took China from a poor country to the second largest economy in the world. But again, the description of these events presupposes a knowledge of China. The enormity of this transformation – in a night, entire neighborhoods were razed, with new buildings being built a week later; in the spans of 10 years, China’s urban population would grow from 26% to 50% of the total population – is not fully developed. But that massive societal shift is never put in any type of measurable perspective which makes it difficult to truly understand what these artists were responding to. Finally, Art & China only features avant-garde, conceptual art from 1989 through 2008. Most of China’s famous artists from 1989 to 2008 who practiced in more staid mediums like oils or watercolors are not featured. But many of the conceptual pieces that the Guggenheim chose to feature were some of the most important from the time period and heavily influenced not just artists in China but also abroad. Yang Jiechang’s Lifelines I, one of the few pieces where there is a little more description about the Tiananmen massacre. Art & China is in its final week, closing on Sunday, January 7. 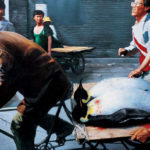 But given the whitewashing of the Tiananmen Square protests and massacre, an average visitor likely will not fully comprehend the depth of what these artists were doing in the early 1990s. It is true that many Western observers seek to view Chinese art through a political perspective and that has, rightfully so, frustrated many of China’s newest artists. But for the artists of the early 1990s, their art was a reaction to the Tiananmen massacre. So it is essential to explain their work through that lens. That fact that the Guggenheim chose not to raises the question as to why. What audience were the curators seeking to serve with their show? Certainly not the visitors, who are left with looking at political art and understanding a movement without any perspective; and certainly not the artists from the early 1990s whose work was completely altered by Tiananmen. 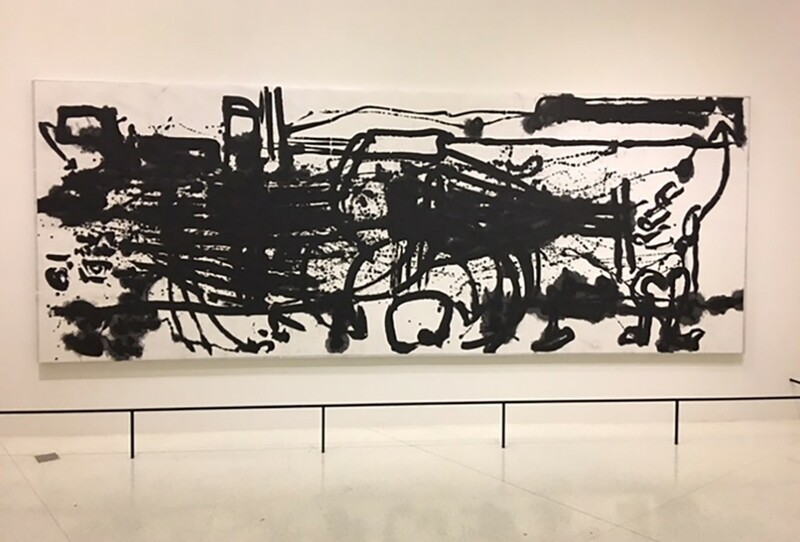 It is unfortunate that the Guggenheim – in a show that starts with 1989 – chose not to fully explain or address Tiananmen. it does a disservice to the featured Chinese artists and their impressive work.